So, this story has been amazing and with issue #5 we get even more goodness. This issue starts out right where the last issue left off with Captain Picard refusing to help the Borg who are getting demolished by the Cybermen. The Doctor tries very hard to show Picard his perspective and what would happen if they don’t offer the Borg assistance against the Cybermen. The Doctor follows Picard into his ready room where eventually Guinan joins the conversation. The Doctor explains to Guinan what is going on and with Captain Picard’s approval, Guinan explains to the Doctor in an amazing black and white flashback why Picard has such a hatred for the Borg. While the Doctor and Guinan continue to explain to the Captain Picard why not helping the Borg against the Cybermen would be for the betterment of the whole universe as well as other universes, Picard won’t hear of it and orders his ship back to Earth in order to help the planets that have suffered at the hands of the combined Borg/Cybermen armada. Elsewhere, we see Rory marveling at the 24th century sick bay and seems to have a very nice conversation with Doctor Crusher. Meanwhile Deanna Troi and Amy talk a bit about Rory and a little more about what it’s like to travel with the Doctor when the Doctor enters sick bay and tells Rory, Amy, Doctor Crusher and Deanna everything that has transpired. Deanna and Doctor Crusher explain why the Captain is doing what he’s doing but the Doctor still doesn’t like this plan and decide that he must find another solution themselves. When the Doctor tells Deanna and Doctor Crusher how much their help would have been, Deanna says that perhaps the Captain needed to hear a different voice to change his perspective while looking at Amy. Back in his ready room, Captain Picard is visited by Amy who tells the Captain that she along with Rory and the Doctor are leaving to try and either talk to the Borg or find a way to take care of the Cybermen themselves. Captain Picard tells Amy that the Doctor’s plan is madness which Amy responds that madness is what they do. Captain Picard asks Amy why she leads such a dangerous life and Amy responds about how she first met the Doctor when she was little and how he came back into her life and saved the world and it wasn’t even the first time. Amy then asks Captain Picard to at least let the Doctor show him something might change his mind. Captain Picard agrees and the Doctor invites Picard into the TARDIS. 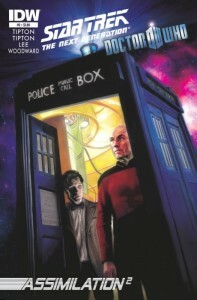 Captain Picard gives the usual “it’s bigger on the inside” line and the Doctor explains a bit about his ship. The Doctor then proceeds to take Captain Picard to different parts of the future to show him what will happen if the Cybermen aren’t stopped. After showing the Captain what happensin different times and different universes the devastation the Cybermen bring and telling Captain Picard that they should help the Borg because it makes them better than his enemies, Captain Picard concedes and says that they will contact the Borg. I don’t know how they do it but each issue has been better than the last and this has been the story I most look forward to each month. I don’t think I have read a comic book that is based on a licensed product like this where the voices are so spot on. Every character sounded so much like I remember, it’s easy to hear the actor’s voice as I am reading the dialogue. The art in this though is the real MVP. The flashback of Picard becoming Locutus was amazing. It’s like the artist copied still-frames of the actual episodes of “Best of Both Worlds” because I remember certain panels as being just like the it was on the show and thought it was brilliant. The characters themselves look gorgeous and the artist and painter deserve so much credit for making this book one of the prettiest on the stands. With each issue, I just want more of this and this issue was no different. Loved it.